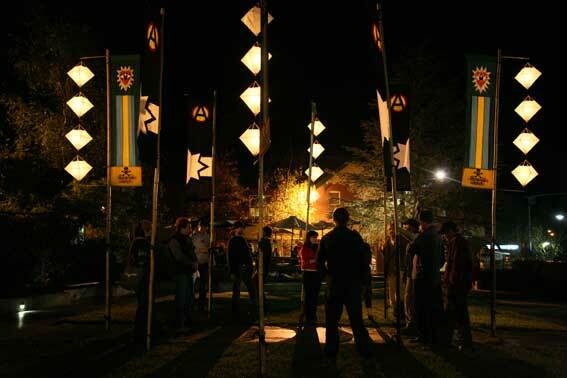 After the presentation of DVDs about indigenous resistance in southern Mexico, the Katoomba Cyanide Watch action assembled in the small plaza out front of The Carrington Hotel in Katoomba Street, Katoomba, a lantern lit circle of friends. 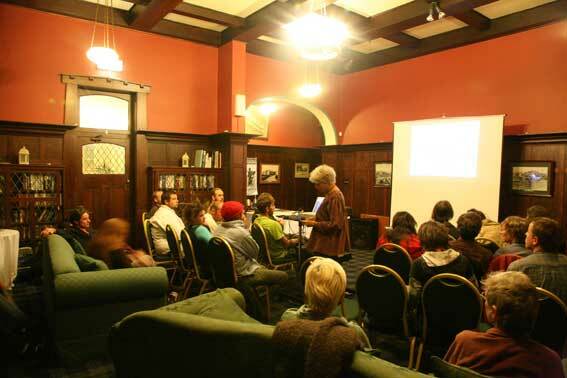 About 40 people had assembled in the room we had booked inside the The Carrington but only about 10 managed the transition from the indoor warmth and the comfort of social change as an abstraction seen on a video to the cold mountain air and rigors of direct action in public place. 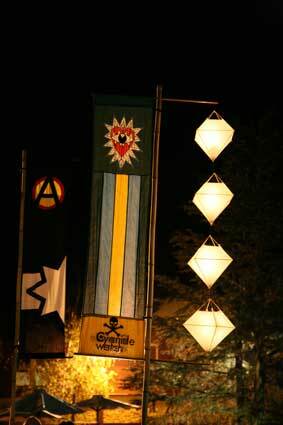 We stood in a circle surrounded by flags and lanterns and I spoke about the Cyanide Watch campaign as building local resistance to the toxic greed of the gold miners in particular and corporate culture in general. "Water is our common ground," I said mixing metaphors. "By defending local water from toxic transports we will win wide based support, build local resistance and secure water and water quality as a public asset for future generations." 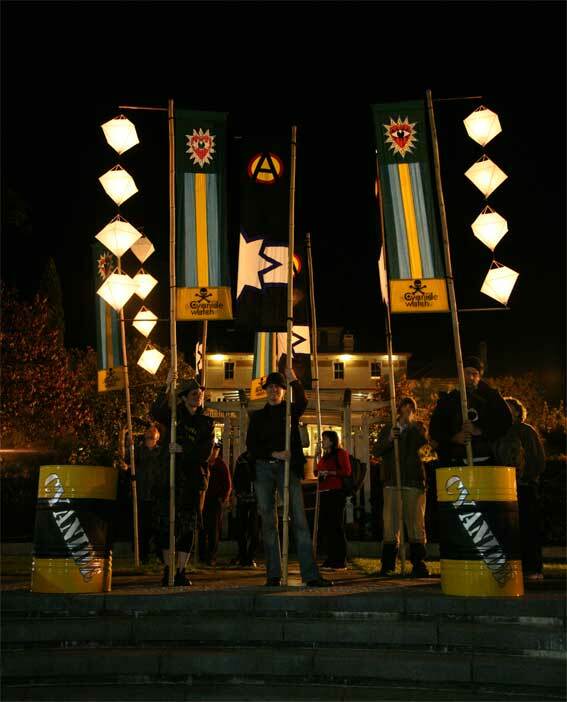 Then we unhitched the flags and lanterns and went in glorious procession down the street and under the subway of the Katoomba rail station to the brazier that had been set up there, to wait by the rail and bear witness to the passage of the west bound Pacific National freight trains. 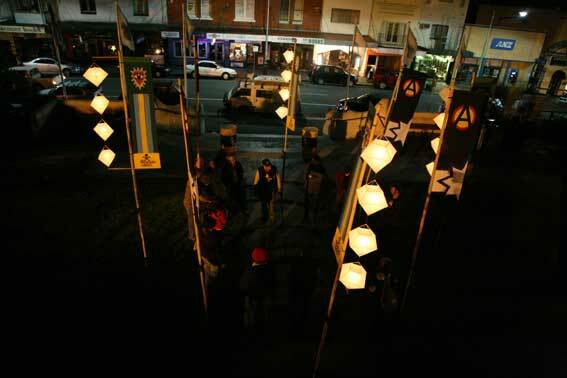 AKEMI Mel was already there when the lantern and flag bearers arrived, brewing chai and with her a circle of teenage girls and boys she had gathered from her time as a local youth worker. 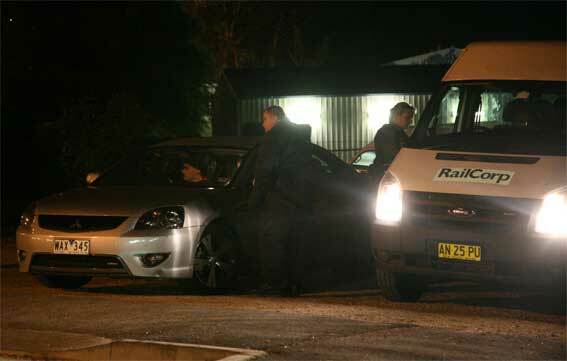 Also present was a bevy of NSW Transit police and a paddy wagon, our guardians and witness for the night. 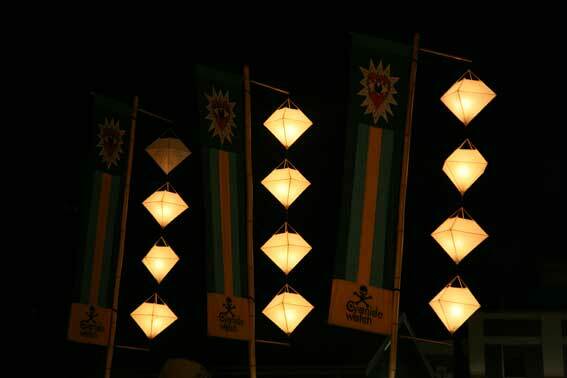 We tied the flags and lanterns to the fence and circled the fire, warming ourselves, delighting in the ambieance of lanterns, fire and friendship. The formal part of the action, the stating of our cause, was brief. I cranked up the Happy Wheels PA, played the Stop the Cyanide track just once and handed the DJ-ing over to others. Nick Chesterfield addressed the circle and spoke of the suffering of the West Papuans, their non violent uprising against Indonesian tyranny was at the time being suppressed with jailings and torture of independence organisers. That brought gravity to the night. And courage to our hearts. 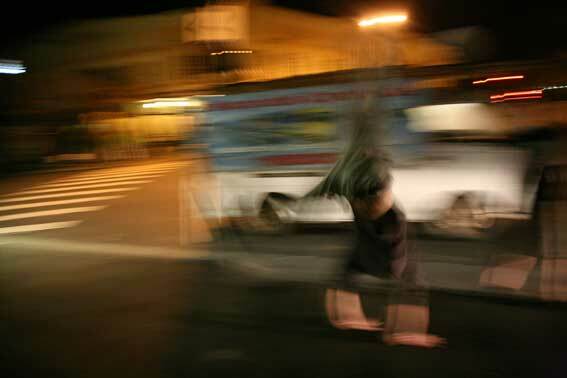 But lightness followed and a spontaneous street party evolved. 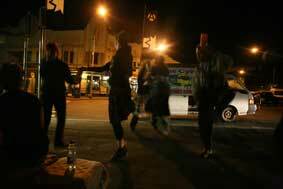 The teenagers danced exuberantly in front of Peacebus.com, its horns blasting into the night. They sang together and the Circus trained of them cartwheeled about. For most of the young people it was their first protest action and when we dispersed at about 1.45 am that evening they thanked me most sincerely for my organising efforts. Such well mannered girls. 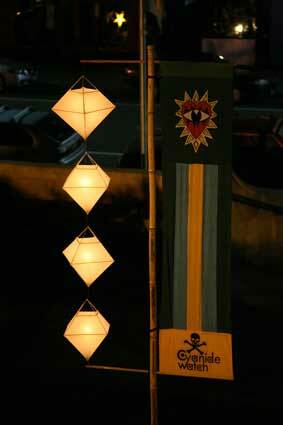 We had been visible, joyous in defense of the Earth and successful too. No cyanide was freighted through the mountains that night. The 'no cyanide' information had been conveyed to me by Inspector Gonz Della Harpe, Duty Officer of the Blue Mountains Area Commandearly earlier in the week. The media release announcing the Cyanide Watch had been sent out the previous Monday and had been copied to the CEO of Orica, the maker of the cyanide, to Pacific National, the carrier of the cyanide, and RailCorp the agency responsible for track safety. 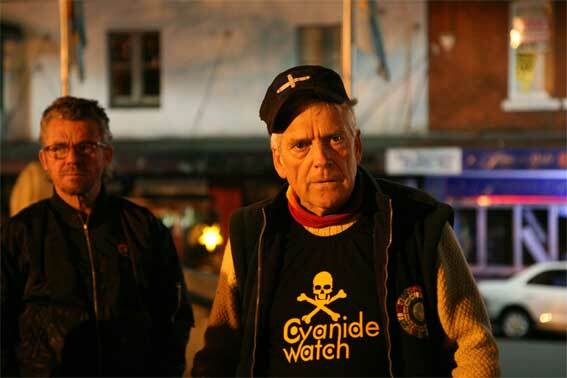 Being visible is what Cyanide Watch is about. When I made contact with local police on the Tuesday they had already been informed of the event and had been contacted by Pacific National with the information that no cyanide would be freighted that night. I could almost hear Inspector Della Harpe grinning down the phone when he told me this. "If it's alright with you, I will claim total responsibility for that decision," I replied. "Go for it," he replied. 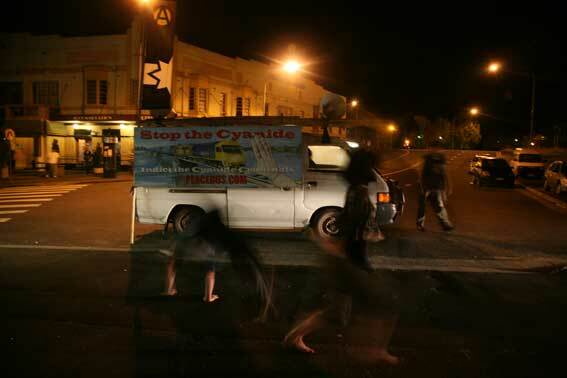 So another media release was put out head lined: Blue Mountains Cyanide Free Friday night. Again copied to Orica, Pacific National and Rail Corp.
'Every day without cyanide freights on the rail is a day closer to banning them forever,' i had myself saying. 'Maybe this is a sign that Pacific National have a conscience about the deadly hazard they are creating for Blue Mountains residents, the World Heritage National Park and Sydney's water supply. 'Maybe Pacific National ought be nominated for a Good Corporate Citizen for a Night award. In fact we didn't see any west bound Pacific National freights go through that night. One went through at 8.30 pm, its driver tooting us a salute before we had assembled at the rail (i sensed his disappointment at not seeing our lanterns and flags). The second went through after we had dispersed. But we didn't need to witness freight trains for our witness to have its impact tis night. Nor did we have to compromise rail safety with a physical blockade of the track. The cyanide criminals were well aware of our presence and our truth and were responding cautiously. Goodwill was with us at every turn. Inspector Della Harpe came by to introduce himself and shake my hand. He chose to come alone and with his hat off as one does on a mission of goodwill. "Isn't free speech a wonderful thing!" he declared. The officers of the nearby paddy wagon focussed their attention on the Hotel Gearins across the street from us. Friday at the gearin can be wild. The cops were acting to inhibit any interference from wandering drunks, our protectors in effect. Not that we suffered any aggro from the pub. 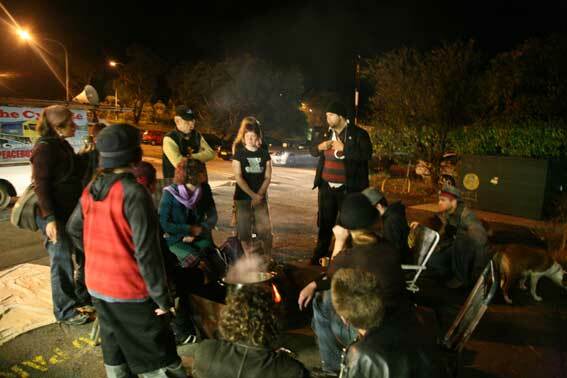 To the contrary patrons came over to us and chatted around the fire interested in our presence and in our cause. Instant converts: they not only to our truth but also loving our style, zinging with our spirit. By the end of the night there were about 8 of them standing about intrigued by our show hugging themselves to keep warm. 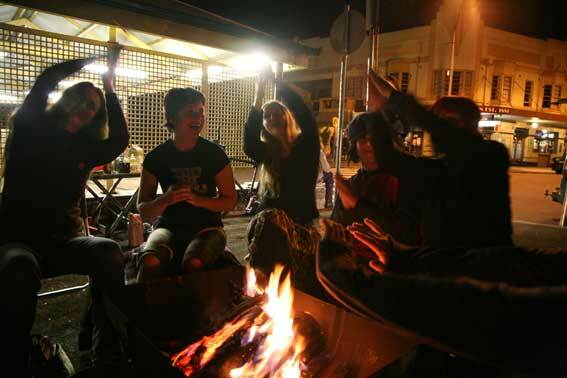 New to me were the plain clothes Trannies, three of them, led by Ali Mahamed, a Fijian Indian, he and his team a uniquely western Sydney racial mix, a Samoan woman and a Iraqi-Kiwi hoodie who later revealed himself to be a graffiti artist. Ali came on strong at first to establish the ground rules for the night - no trespassing on the rail corridor - but they were rules we had no intention of contesting. I explained to Ali that bearing witness works its influence in subtle ways. "We don't have to have confrontation and crowds of thousands to get noticed," I said. "Orica and Pacific National know we are here and why. And so do the cops." 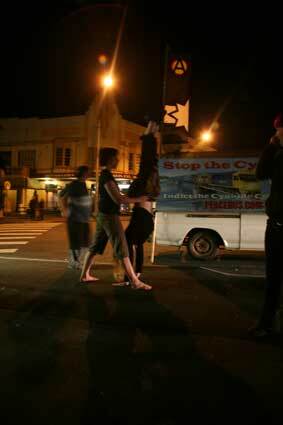 Ali confirmed by saying that most of the RailCorp radio traffic that night had been about our protest. And so they too became our guardians and our audience. 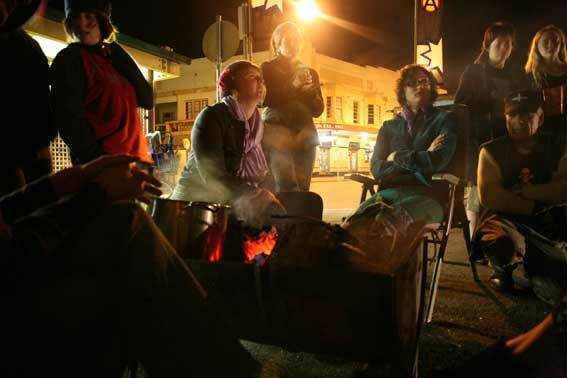 Concerned for their comfort, I had attempted to get the brazier fired up early in the night so that they might keep warm while they waited for us to arrive at the rail. But when I returned I found the fire near out. "What kind of rail workers are you to let a fire go out," I joshed. "No kindling," the Samoan replied defensively. Truth was these guys were cool, an elite corps in a new corps of police and totally smart about the youth culture of night rail travel. For six hours the Trannie cops stood about or alternatively warmed themselves in their vehicles. They could not but see and hear what we were on about. Nor could they be uninfected by the joyful enthusiasm of the young people protesting about cyanide in front of them. This is what i call culture making. This is the path of peaceful social change. At the end of the evening Ali gave me his email contact urging me to contact him when the next Cyanide Watch action. "Keep up the good work," he said on parting. 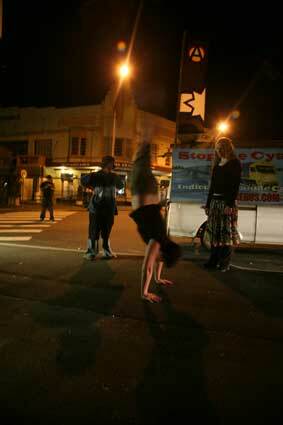 Pre-publicity for Katoomba Cyanide Watch. Doing best we can. For peace! For justice!